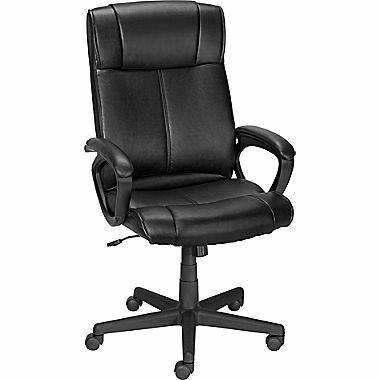 Turcotte Luxura Office Chair Just $49.99! Down From $149.99! You are here: Home / Great Deals / Turcotte Luxura Office Chair Just $49.99! Down From $149.99! Staples has this Turcotte Luxura Office Chair on sale for $49.99 (Reg. $149.99) through 5/3! Plus you can get FREE shipping and 5% back in rewards if you are a Staples Rewards Member! The Staples Turcotte Luxura High Back Office Chair offers ergonomic support for long periods spent sitting at a desk. Its high back includes lumbar support and padded armrests to encourage more natural posture. You can adjust the chair to meet your needs with its pneumatic seat-height adjustment and adjustable seat/tilt recline with lock. The chair’s five-star nylon base offers stable support, while its carpet casters make the chair easy to move at your workstation. Made with Luxura upholstery, this executive chair offers the look and feel of real leather.